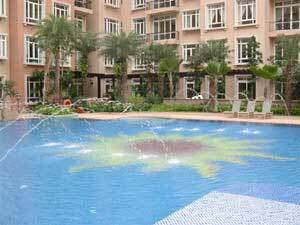 Private condominiums and apartments, where residents share the common compound and facilities, are the preferred choices for most expatriates. They come in various sizes, ranging from low-rise blocks to extensive high-rise developments. Most condos come with good-quality finishes, luscious landscaping, basement car park and full recreational facilities such as clubhouse, children's playground, gymnasium, swimming pool, squash, tennis courts, and sometimes even a putting green. Most developments have 24-hour security surveillance, intercom systems and sometimes even home automation systems. The units range from studio, 1, 2, 3 and 4-bedroom units, penthouses. They start from as small as 500 square feet to as large as 8,000 square feet. APT - Apartment. The compound has smaller land area compared to Condominium. May not have recreation facilities. CLUSTERHSE - Cluster House. Strata titled landed house with shared compound and recreation facilities. CONDO - Condominium. The compound has bigger land compared to Apartment and usually has recreation facilities. CONDO EXEC - Executive Condominium. Condominium restricted by HDB's rules and regulations on Rental & Sale. HUDC - Privatised flat originally built by the Housing & Development Board (HDB). May not have recreation facilities. PENTHSE - Penthouse. Biggest unit in the Apartment or Condo block. Usually on the top floor with two levels. TOWNHSE - Townhouse. Apartment with ground level entrance and usually is 2 to 4-storey high. WALKUP - Walkup Apartment. Low rise apartment without a lift or recreation facilities.